Chinese Electric Carmaker Aims To Become A Global Brand : Parallels China wants 20 percent of its vehicles to be electric by 2025. The BYD company, in the southern city of Shenzhen, sees itself as part of the country's "new energy era," says its spokesman. 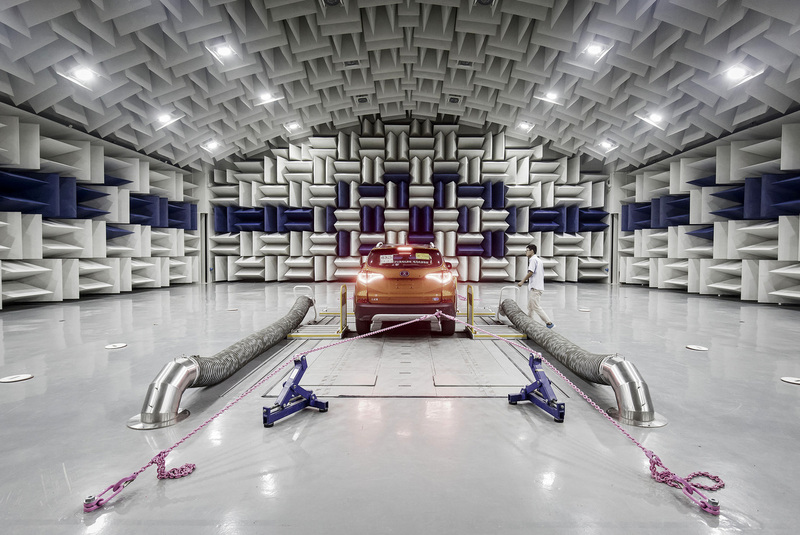 A vehicle sits in an acoustics testing lab at BYD headquarters in Shenzhen. When President Trump arrives in China later this week as part of his Asia visit, he is expected to press the country's leader, Xi Jinping, for better trade deals with the United States. Trump will be accompanied by a high-powered delegation of American CEOs and is expected to announce a flurry of commercial deals. In the southern city of Shenzhen, a city of towering glass skyscrapers, high-tech industrial parks and enormous shopping malls sometimes called the Silicon Valley of China, it becomes apparent that the U.S.'s economic goals may have nothing to do with China's own. China has ambitious plans to dominate industries, and in some cases, it already has. A BYD monorail train stands at a station at the company's headquarters in Shenzhen, China. 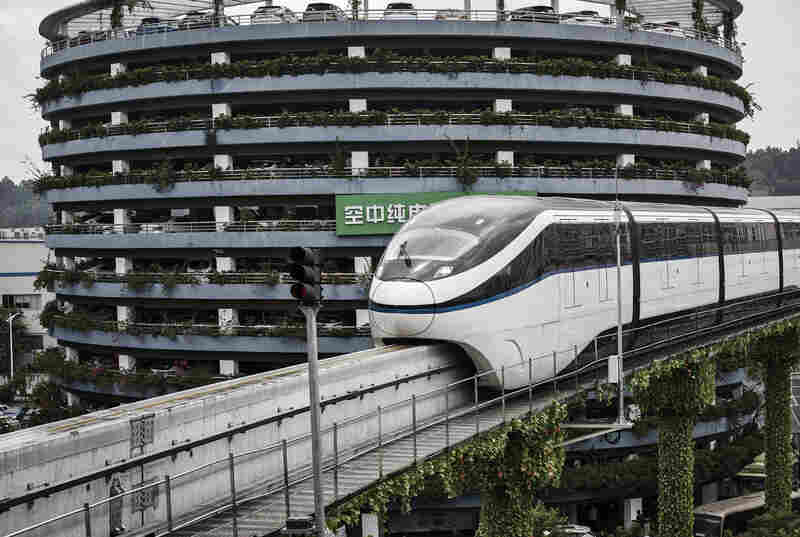 On a manicured corporate campus in Shenzhen, with a monorail sky train swooping in a dramatic arc around its periphery, China's ambitions are everywhere on display. The campus is home to the world's highest seller of electric vehicles, the Chinese company BYD Co. Ltd. — the company's initials stand for "Build Your Dreams." BYD hopes to do what no other Chinese automaker has done before: become a global brand. Last year, BYD sold fleets of electric buses to Los Angeles and Denver. Warren Buffett owns a 10 percent stake in the company, and Leonardo DiCaprio is its brand ambassador, appearing on company billboards and commercials. The company is worth $18.4 billion, according to Forbes, and saw its stock price increase by nearly 60 percent this year. At 5:00 p.m. on workdays, factory workers in pale-blue company uniform shirts stream out of factory buildings. "This is the start of their leisure time," a BYD guide says. Almost 40,000 people work on this campus, and some live just a few feet from the factory in large, concrete-block apartment buildings made colorful by the laundry strung on the balconies. The factory workers live four to a room, the guide says; office workers each have a room to themselves. 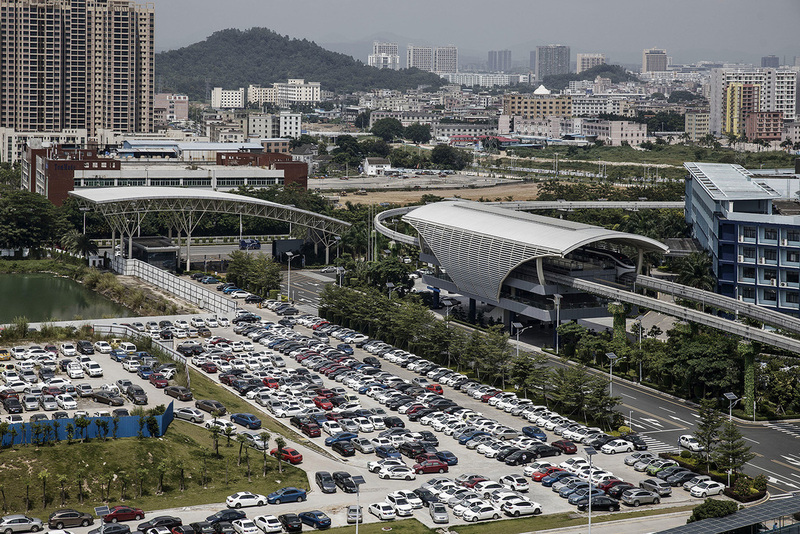 A BYD monorail train travels on an elevated track at the company's headquarters in Shenzhen. The blue-shirted workers are helping catapult China into the "new energy era," as BYD chief of public relations Richard Li puts it. Li, also clad in the company's pale-blue shirt, is echoing the words of his country's leader. In a recent 3 1/2-hour speech in the Great Hall of the People, Xi hailed China's "new era" of power and asserted that China must take the "driving seat" to respond to climate change. "Any harm we inflict on nature will eventually return to haunt us," he said. China's pollution problem is no secret, least of all in smog-choked cities like Shenzhen and Beijing. All of which puts this sleek manufacturing center in lockstep with government policy: China has said it wants 20 percent of its fleet to be electric by 2025, and in order to force that change, said it will soon begin enforcing a penalty — similar to a carbon tax — on car makers that do not produce a certain percentage of electric or hybrid vehicles each year. At the same time, the government is aggressively subsidizing Chinese electric vehicle companies to ensure they own the market. 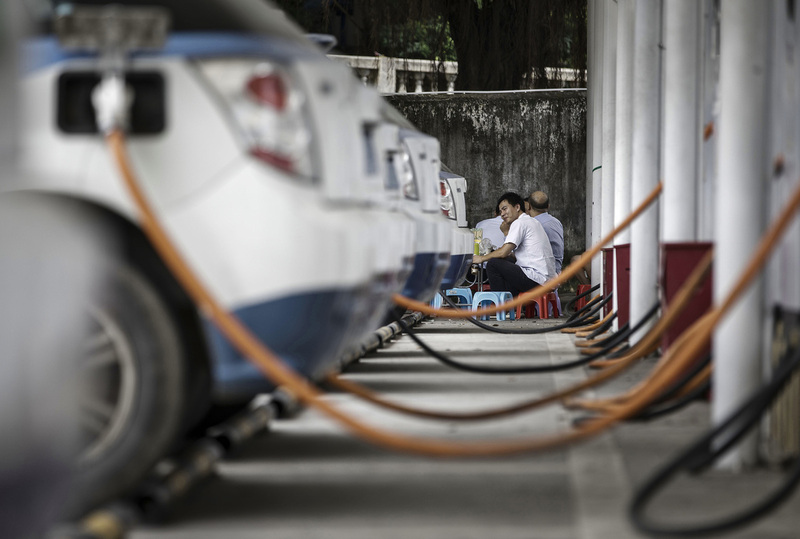 "In many ways, China already is dominating" the electric vehicles market, says Alvin Lin, the climate and energy policy director in Beijing for the Natural Resources Defense Council. "China is really viewing this as a strategic industry and putting their weight behind it." Lin says China has inherent advantages, such as its "late developer status" — because there are fewer cars per capita in China than the U.S., Chinese consumers may be more open to buying electric. A row of BYD electric taxis are charged up at the company's charging station in Shenzhen. But the prices of these green tech cars in China are still fairly high for consumers: BYD's pure electric sedan costs around $45,000 before incentives and subsidies from the Chinese government, and its hybrid SUV starts at $30,000 before incentives and subsidies. Li of BYD speaks as though China has already completed its transition out of what he calls the "conventional vehicle age." But that's not quite true yet. BYD sold more than 100,000 electric and hybrid vehicles last year. While that's more than any other company sold in China in 2016, it scarcely amounts to a blip among the 28 million cars sold there in the same period. BYD has had more success with taxi and bus sales than with individual consumers, a problem that the Palo Alto-based electric vehicle manufacturer Tesla has also encountered. One Shenzhen taxi driver, Liu Jun Fang, says his BYD electric car is a smooth ride. But he complains about a lack of charging stations; he can only drive about 180 miles without a charge, he says. He has had passengers tell him that American electric cars, made by Tesla, go farther — which is true. He is also concerned about the radiation emitted from the batteries in the cars. 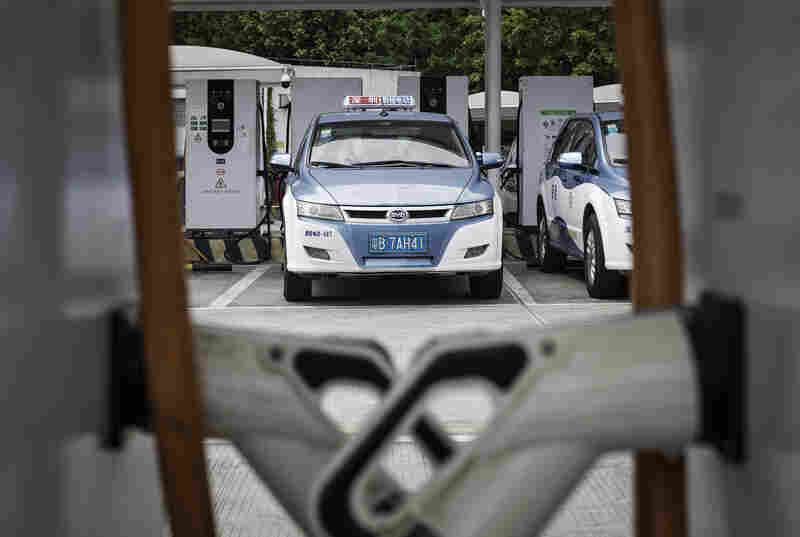 It's a big enough concern among drivers in China that BYD recently brought taxi drivers from the Chinese city of Taiyuan, where the entire fleet is electric, to its campus to conduct a public radiation test inside the cabs. A BYD electric taxi is charged at the company's charging station in Shenzhen, China. At BYD, what matters most is that its cars are entirely Chinese-made. Even the front grill of its hybrid SUV is meant to call to mind the armor worn by ancient Chinese warriors. The appeal of China's market is not lost on U.S. automakers. For years, they have been trying to get into China but have bumped up against Chinese government restrictions. China has steeper barriers to automotive trade than any large market in the world, requiring foreign companies either to pay high tariffs or set up joint ventures with Chinese companies and share their technology. "China is OK with competition in sectors it deems priorities, so long as China dominates," says Lester Ross, a partner at WilmerHale who represents foreign companies in China. "It's a very nationalistic approach, and we believe it holds China back because it does not foster true competition inside China." Nevertheless, U.S. car companies have continued to pound on China's doors. Tesla just announced it will become the first foreign car company to have a wholly owned manufacturing operation in China. 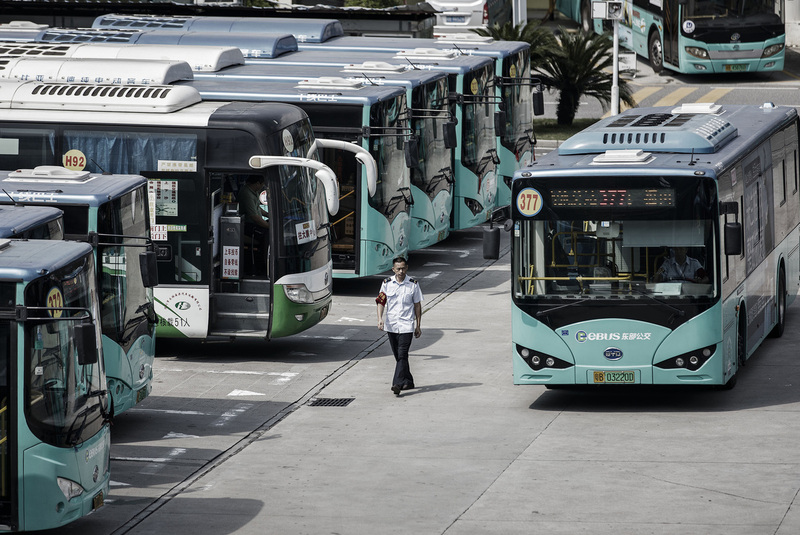 A worker walks past a BYD electric bus at a public transportation hub in Shenzhen. "It's really the only way to make the cars affordable in China," Tesla CEO Elon Musk said in a recent earnings call. The plant will operate inside a free-trade zone, allowing Tesla to hold onto its intellectual property. What sounds like a coup for Tesla, though, may actually be a strategic win for China. Tesla will still have to pay steep tariffs to the Chinese government and must purchase its parts from Chinese manufacturers. Such issues are sure to come up during Trump's visit to Beijing later this week. Trump talked tough on China during the presidential campaign, and his administration recently launched an investigation into whether China has stolen U.S. intellectual property. That investigation could grant the administration broad authority to retaliate against China — a tactic, American trade experts say, that China has traditionally been better at employing. "China wants to set its own standards," Ross says. "And it can. China has four times the population of the U.S., it is the first or second largest economy in the world and it doesn't buy into the central expectations of the global economy." Miranda Kennedy is a senior editor at Morning Edition. You can follow her on Twitter at @mirandatk. NPR producer Alyssa Edes contributed to this story.